To those persons born in the first half of the twentieth century the name "Packard" might bring to mind images of the Packard automobile. However, to some Americans and Canadians the name also reminds them of early examples of electric incandescent lamps. The Packard automobile was manufactured during the years 1899 - 1958, while Packard lamps were made starting about 1891. 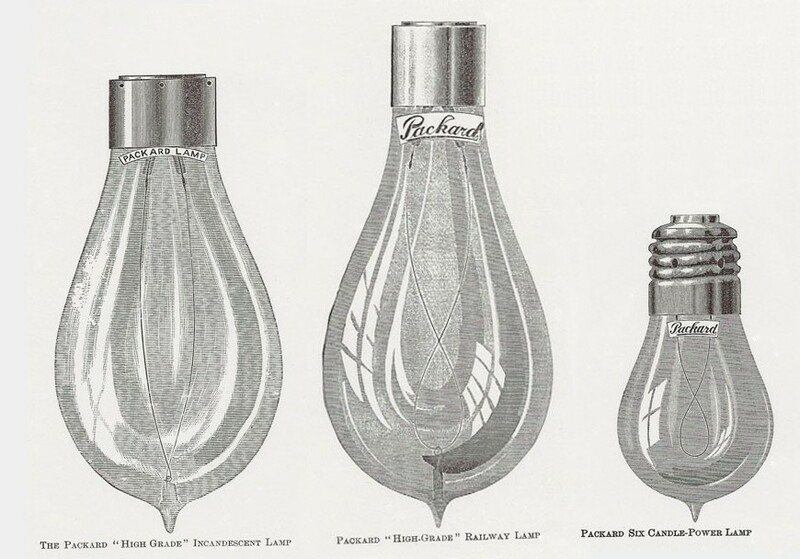 After about 1912 lamps were identified as being General Electric, although Packard paper labels on the bulbs continued until much later - perhaps 1925. 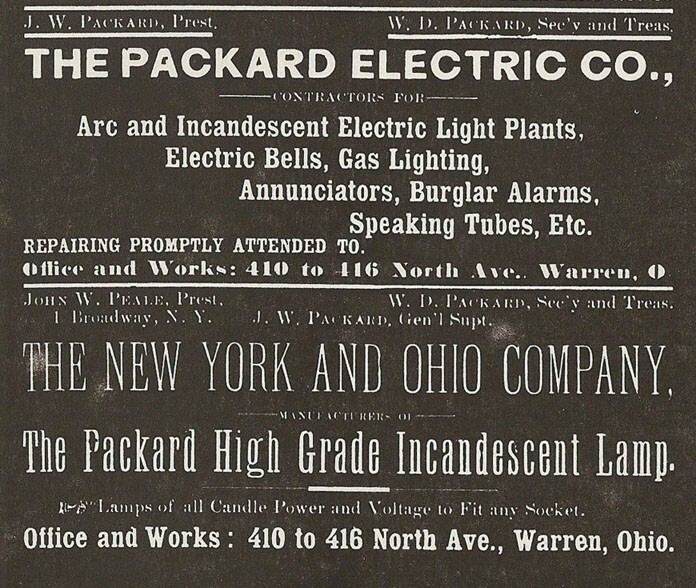 The manufacture of parts for the automobile was undertaken by the Packard Electric Company whereas the Packard incandescent lamp was manufactured by The New York & Ohio Company, although the two companies shared the same buildings at one time (see advertisement below). About 1914 the name of the New York & Ohio Company was changed to the Packard Lamp Division of the General Electric Company. The Packard Electric Company was formed on 5 Jun 1890 and the New York & Ohio Company was formed on 27 Jan 1891. It can be somewhat frustrating to try to follow the sequence of events of lamp manufacturers in the past. For example, the New York & Ohio Company was sold to Franklin S. Terry of the National Electric Lamp Company on 1 Oct 1903. However, little changed until after 1911 when the U.S. Government brought suit against the main lamp manufacturers because of the activities of the Association of Licensed Manufacturers of Incandescent Lamps. At that time GE exercised its option to purchase the remaining 25% of the National stock, and National officially became part of General Electric. Prior to 1911 it was not generally known that General Electric was a silent partner with National. James Packard worked in the Sawyer-Man shops in 1884, after leaving college, and returned to his hometown of Warren, Ohio in 1890. He was issued at least 13 lamp-related patents. However, eventually his interest turned to the horseless carriage, the automobile, and direct involvement in lamp manufacture ceased. In total he was issued at least 43 U.S. patents. His brother was more business oriented, although even he managed to be issued several patents, one of which was for the incandescent lamp. 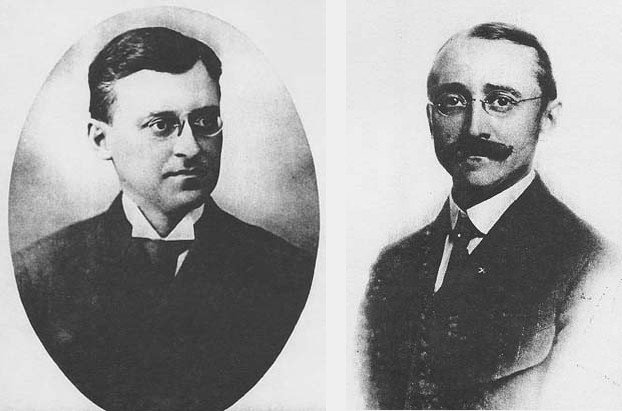 The Packard brothers formed a Canadian branch of the electrical firm (Packard Electric Company) in the year 1894. That company was merged with the Dominion Electric Company of Montreal to result in The Packard Electric Company Limited. A branch of this firm was constructed in St. Catherines, Ontario in 1895 and was a subsidiary of the firm in Warren. They produced transformers and lamps. A few remarks are appropriate as it regards the stem design in the lamp shown below. It was a design applicable to lamps with multiple filaments. James W. Packard was issued the patent and the assignor was the Westinghouse Electric Company. This patent design was conceived before Packard had returned to Warren, Ohio in 1890. The design was used in Packard lamps thereafter, even when the lamp had only one filament. The filament mounting, utilizing the "V" stem arrangement, was explained in the patent as being less costly to manufacture than the method commonly used. 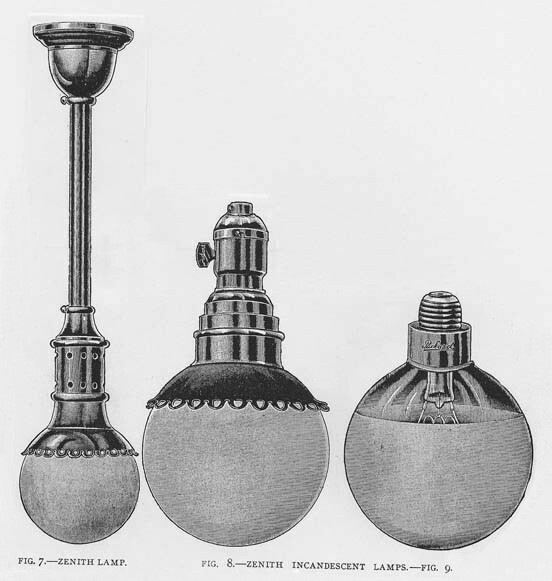 The illustration below shows some lamps, from left to right, taken from articles published on 25 Mar 18911, 29 Jun 18923, and 28 Jun 18938. The filament of the Packard "High Grade" Lamp of 90 volts and higher was supported from the lamp tip by a platinum wire.The reason for this was to prevent drooping or vibration of the filament. Lower voltage lamps did not require the support structure. The Packard "High-Grade" Lamp that was used on railways utilized the tied-down design because of the violent vibrations that could occur. 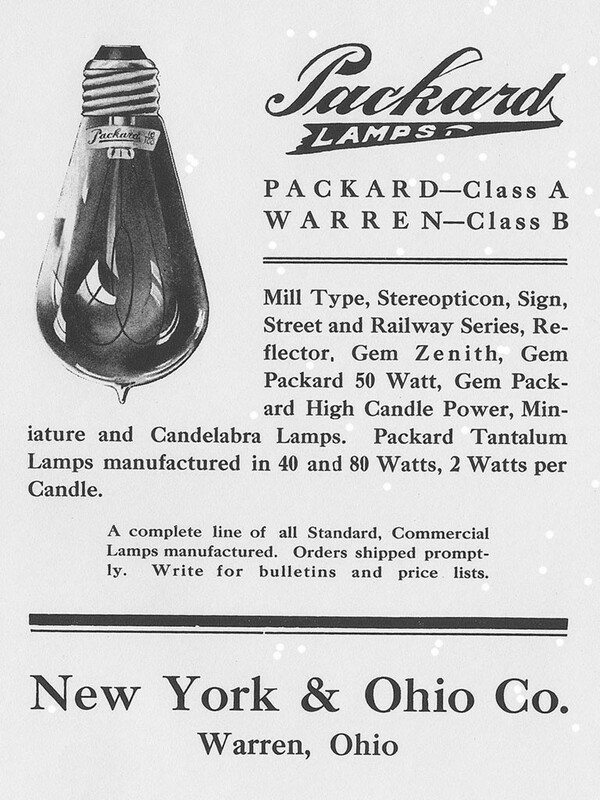 The Packard Six Candle-Power Lamp was utilized on 50-52 volt systems. At higher voltages they could be burned two in series. The Electric Appliance Company, the Western agent for The New York and Ohio Company, burned over 500 of these lamps in an illuminated sign at the 1893 Columbian Exposition in Chicago. The additonal lamps shown below appeared in an article published on 1 Nov 189312. The New Packard lamp was constructed to avoid infringement of the Edison patent. The neck of the lamp was closed by cement and mica and the leading-in wires were made of iron. 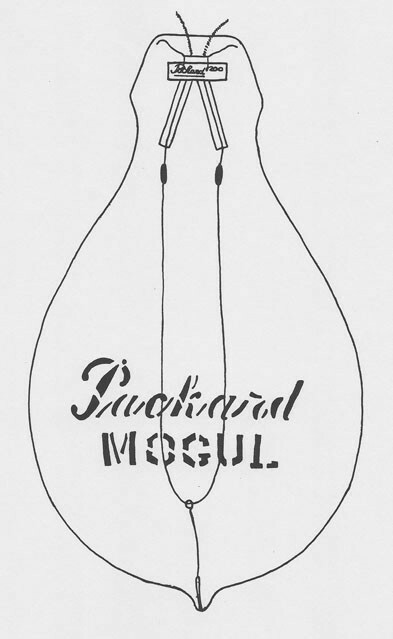 This new style of lamp was made in sizes from 6 to 50 c. p. The Packard "Mogul" Lamp was made in two classes, "A" (high efficiency) and "B" (longer duration). The efficiency attained was 2 1/2 watts per candle. A special porcelain socket and shade were used with the lamp. At that point in time the lamps were made at 200, 300 and 500 c.p. and work was underway to result in a 1,000 c.p. lamp. 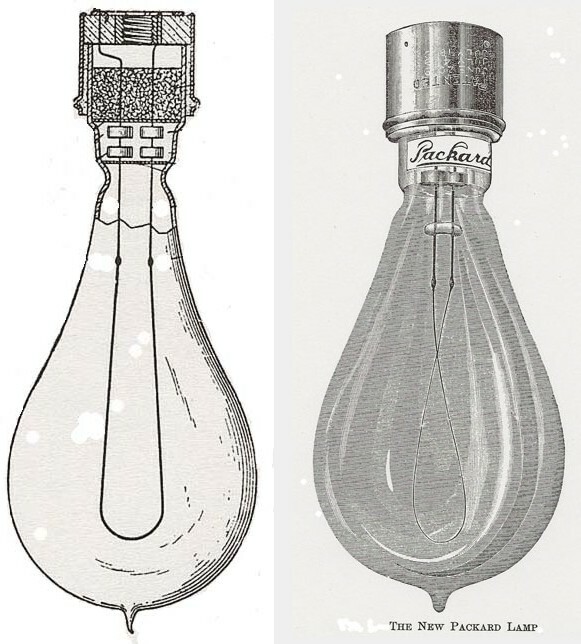 A comparison is shown below of the "New Beacon" lamp, on the left, and The New Packard Lamp, which appeared in print on 1 Nov 1893. Note that each lamp has the cylindrical metal radiators on the lead wires which were utilized to reduce the temperature of the wires (U.S. Patent No. 503,770). Patent numbers can be seen on the Packard lamp base. Three dates are given. Although the years cannot be easily read, the months and days can be seen to be June 20, July 4 and July 18. The New Beacon lamp was covered by several patents when manufactured. The patents are in the names of William Emery Nickerson and Edward Egbert Cary. A partial listing of Nickerson and Cary patents is shown below. Note that all patents listed have the same months and days as are stamped on the New Packard lamp. The sketched lamp outline below was made by the writer by projecting the lamp image onto a piece of tracing paper. The pattern was then sketched to result in the above drawing. The small label at the top of the lamp is a Packard label, indicating that the lamp candlepower is 200. The maximum bulb diameter is 5-5/8 inches. The half-frosted lamp shown below appeared in an article dated 26 Sep 189617. The Zenith lamps shown below appeared in an article dated Aug 190318. Quoting from that, "Fig. 8 herewith shows the Zenith incandescent lamp made by the New York and Ohio Company, of Warren, Ohio. The lamp is intended as an intermediate between the arc lamp and the ordinary incandescent lamp. It is made in two sizes, 25 and 55 candle-power, at efficiencies of 1.9 and 2.5 watts per candle-power, depending on the size and voltage. The lamp gives a particularly brilliant, yet soft, white light, which is evenly distributed beneath the lamp. The range of voltage of this lamp is from 90 to 150, and it is furnished regularly in Edison base, but can be furnished also in T. H. Base. The filament is located in the bulb with reference to the polished aluminum reflector which performs an important function. The lamp can be used on either direct or alternating current and requires no attention during its life. The lamp is fitted with a simple collar adapted for use on any style or fixture or furnished complete with ceiling stem as shown by Fig. 7". 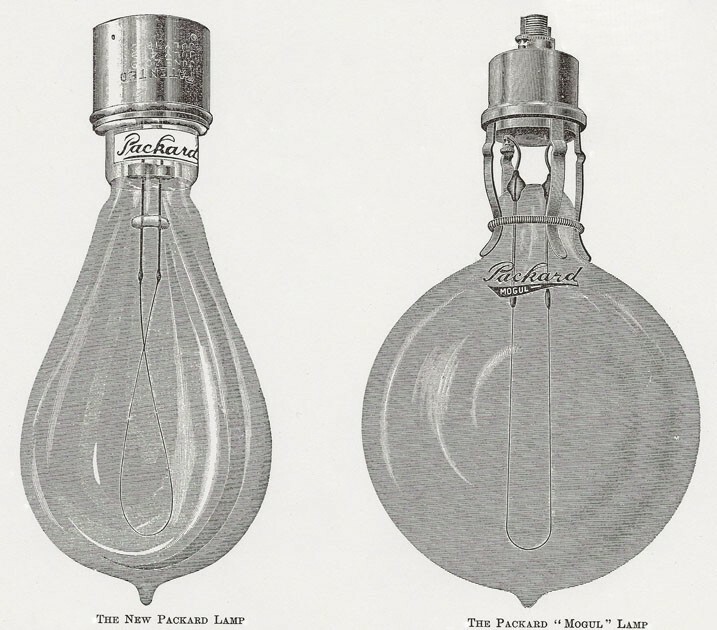 Different types of Packard lamps were marked with differing paper labels. The below selection appeared in a General Electric Standardizing Notice in the year 1914. "The New Packard Incandescent Lamp", The Electrical Engineer, Vol.11, 25 Mar 1891, p.377. "The Packard Vacuum Pump for Exhausting Incandescent Lamps", The Electrical Engineer, Vol.11, 6 May 1891, p.527. 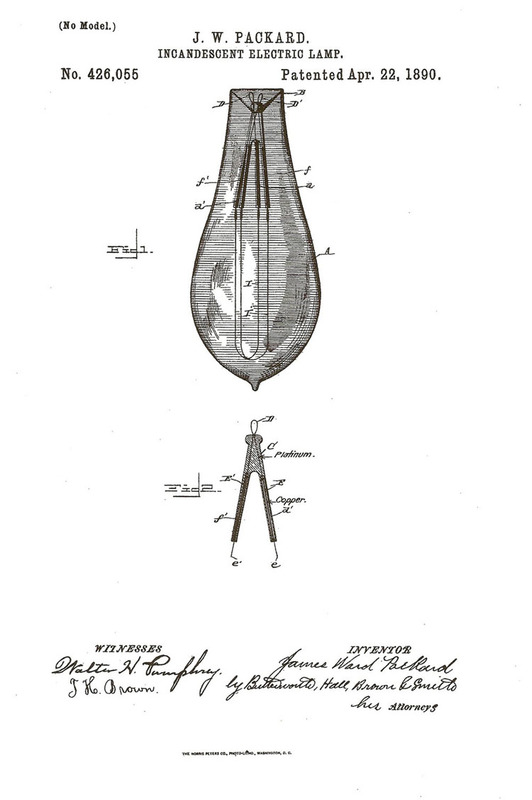 "The Packard 'High-Grade' Lamp", The Electrical Engineer, Vol.13, 29 Jun 1892, p.668. "The Packard Lamp", Western Electrician, Vol.11, 9 Jul 1892, p.24. "Exhausting Incandescent Lamps by Means of Mercury Pumps". J. W. Packard, The Electrical Engineer, Vol.14, 20 Jul 1892, p.57. Western Electrician, Vol.11, 20 Aug 1892, p.108. "The Packard Lamp in Canada", The Electrical Engineer, Vol.14, 24 Aug 1892, p.185. "The Packard Six Candle Power Lamp", The Electrical Engineer, Vol.15, 28 Jun 1893, p.635. "The Packard Six Candle Power Lamp", Western Electrician, Vol.13, 1 Jul 1893, p.9. "The 'New Beacon' Non-Infringing Incandescent Lamp", The Electrical Engineer, Vol.16, 23 Aug 1893, pp.169-171. "Suit to Enjoin the Packard Lamp", The Electrical Engineer," Vol.16, 13 Sep 1893, p.251. "The New Packard Lamp", The Electrical Engineer, Vol.16, 1 Nov 1893, p.397. "New Packard Lamps", Western Electrician, Vol.13, 4 Nov 1893, p.242. "The Coiled Filament Packard Lamp", The Electrical Engineer, Vol.17, 27 Jun 1894, p.568. "Coiled Filament Packard", Western Electrician, Vol.14, 30 Jun 1894, p.324. "Packard Lamps and Transformers in Canada", The Electrical Engineer, Vol.20, 14 Aug 1895, p.169. "Half Frosted Lamp", The Electrical World, Vol.28, 26 Sep 1896, p.374. "Zenith Incandescent Lamps", American Electrician, Vol.15, Aug 1903, pp.432-433. Advertisement, 13th Annual Convention of the Ohio Electric Light Association, 20-22 Aug 1907. "Tungsten Lamp Improvement", Electrical World, Vol. ?, 22 Sep 1910, p.695. "History of the National Electric Lamp Company and Its Subsidiary Companies", F. S. Terry, 28 Nov 1910. "Story of the Dawn of Electric Light Industry in Warren - The Packard Boys Pioneers in Enterprise that's Making City Famous", 1912 Centennial Newspaper, Warren, Ohio. "History of Youngstown and the Mahoning Valley, Ohio", Joseph G. Butler, American Historical Society, New York, Vol.2, 1921, pp.233-234. "Packard - A History of the Motor Car and the Company", Beverly Rae Kimes, Editor, General Edition, Third Printing, 1978 ISBN 0-915038-11-0: Automobile Quarterly Publications. "Eminent Man Passed Away", Western Reserve Democrat, 15 Nov 1923, p.1. "Warren, Ohio - Biography - Packard Family", Warren Public Library, Warren, Ohio, pp.90-91.